Millville, New Jersey. If the predictions from the organizers of the first official European style RallyCross event in the USA are anything to go by, RallyCross could very well be the next big thing in American Motorsports. 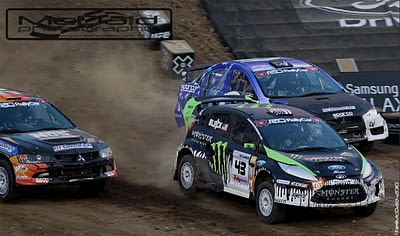 The first three 2010 RallyCross events will be at New Jersey Motorsports Park (NJMP), the vast multipurpose motorsports venue. has seen its many ups and downs as it grew beyond the British Isles into mainland Europe. Despite thriving European and British Championships with short action packed races, RallyCross in Europe still takes a back seat to stage rally, in particular the WRC. There is no question that bringing European style RallyCross racing to the USA is a very smart move on the part of Rally Car, the organizers, who were formerly known as Rally America. But, I have to ask, will an open track venue like New Jersey Motorsports Park deliver the impact needed to draw fans away from the many, many other door-to-door, wheel-to-wheel motorsports events that already exist in the U.S.? Despite the fact that Rally America’s [now Rally Car], stage rally championship has seen a dramatic growth in spectator interest in the past three years, U.S. rally is still merely a blip on the U.S. mainstream motorsport radar. As much as I hate to admit it, if European RallyCross is marketed correctly to the American motorsports fans it has the potential to far surpass the popularity of stage rally in the USA at this time. To its advantage, New Jersey Motor Sports Park is conveniently located near Philadelphia, New York City and Washington, D.C. One would hope that RallyCross peaks the interest of motorsports fans in these major metros; fans that might regularly attend other forms of racing at NJMP. From what we understand ESPN will also cover the first three RallyCross events, although no TV schedule has been released at this time. We have yet to see the actual track layout, but I have no doubt that NJMP has the means to build a world class European style RallyCross course. Organizers promise jumps and bumps to unsettle the drivers and the cars, but we have also been told that the course will be 70% tar and 30% dirt. If there are not enough transitions from tarmac to dirt then the fans may look at this as just another track event, and as we know there is no shortage of these in the U.S. I am in no way pre-judging the venue, but pardon me as I digress, I truly believe that to be successful in the long term and gain the attention of the mainstream U.S. motorsports fans, RallyCross organizers need to go beyond the conventional European RallyCross open track layout. In my view they have already proven they have the insight to do this. At XGAMES 16 in Los Angeles just a few short weeks ago, ESPN and the Rally Car group gave American fans their first look at RallyCross up close and personal. I can tell you first hand as someone who has attended RallyCross in Europe, what we saw in the LA Coliseum brings RallyCross to the next level. When I say the next level, I am referring to running the events in a stadium environment versus an open track; the roar of the cars was much more amplified and the tight course is so much more exciting. Although the cars only exited the stadium for a few seconds it greatly added to the thrill of the fans as they anticipated who would fly into the stadium first. The only thing that would need to change from the XGAMES set-up is the large jump. 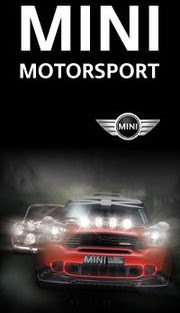 It would be just too big for regular competition as it inflicted way to much damage to the cars. It was only in recent days that I learned that this very same venue, the LA Coliseum, was the birthplace of Supercross. How cool is that? According to the LA Weekly, “Mike Goodwin had the idea of putting on a motorcycle show in a stadium in 1972. He persuaded the manager of the Los Angeles Coliseum to rent the stadium to him for an event Goodwin called ‘the Superbowl of Motocross’. Goodwin trucked in hundreds of tons of dirt, built all kinds of jumps and turns, and advertised it heavily. Celebrities like Steve McQueen came to watch. There were scantily dressed women, and prizes for the fans. But the big attraction was the famous peristyle jump. The riders rode a dirt ramp up through the stands and disappeared into one of the smaller side peristyle arches. Then, a moment later, they’d come flying back into the stadium through the big central arch, sailing 100 feet through the air before hitting the downhill ramp. It was ‘fantastically suspenseful,’ and ‘The fans went wild.’” [Source: Motorsport retro]. And Supercross was born. Americans in motorsports have always been driven to add their own twist to whatever they do. 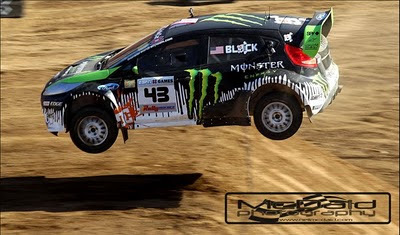 Ken Block brought jumping a rally car to a whole new level by being the first to jump a rally car 171 feet. He is also currently working on his third edition of his wildly popular Gymkhana videos, which draw millions of viewers on YouTube. U.S. RallyCross organizers should continue to push the envelope and reinvent this sport and give it that special American twist. Call me crazy, I am used to it by now, but I can envision RallyCross as an opening act for a Monster Truck event with their thousands of fans already in place. It really would not take very much effort to make a RallyCross course work within the Monster Truck layout. To further this thought, XGAMES motorcycle and rally racing legend Travis Pastrana, is one of the driving forces behind the current growth in U.S. rally attendance. Interestingly, he also sponsors the Travis Pastrana Monster Truck. What better way to introduce a whole new audience to RallyCross than mix these two popular events with a major star already in place? Let’s hope that NJMP can deliver a great course that will blow our minds during these three events. I look forward to bringing you all the action from next weekend’s first event. There should be no lack of thrills and spills. Subaru USA team drivers Travis Pastrana and Dave Mirra will be on a mission to dethrone Ford Fiesta Team driver Tanner Foust who stole the show and collected all the Gold at XGAMES Rally. It would also come as no surprise if one of the privateer teams steals the show, though. As mentioned this will be one of three events planned for 2010, when all three event have completed “RC –Rally Car” will crown its first ever RallyCross Champion.